Our European Sales Manager, Neil Matthews, took a double victory on this weekend’s Nicky Grist Stages. Not only did he win his class by a comfortable margin of 1 minute 23 seconds, he also netted the biggest prize in national rallying the Ravenol Nicky Grist Challenge. 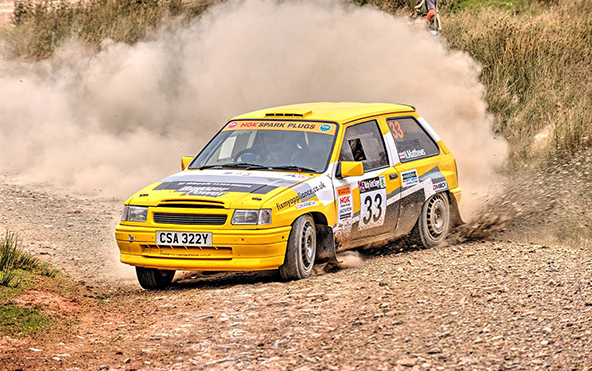 Partnered for the first time by Bridgnorth co-driver Jez Rogers, Matthews nearly threw any opportunity of success away with a 3rd gear crash on the events very first stage. “There was a dust cloud left by the previous car still hanging just before a fast left hand bend, I thought I still had some straight road to brake on but I was proven wrong. We left the road on the right and hit a bank and tree stump which pitched the car onto two wheels and we were very lucky not to roll” commented Quinton Motor Club’s Matthews. The pair continued but the rear suspension was badly damaged and emergency repairs were carried out over the rest of the morning, until a full repair could be completed at the lunchtime halt “We lost a lot of time during the morning stages as the handling of the car was badly affected, I knew I had to really push in the second half of the event to maintain any chance of being in the running for the prize” said a frustrated Matthews. Following the full repair of the Bowyer powered Vauxhall Nova, Matthews stormed through the afternoon stages to reel in his fellow 1600cc competitors and take the class victory. This would put him in with a good chance in the class based competition with an unrivalled prize of a full seasons paid entries into the 2015 BTRDA –Britain’s top national gravel championship, along with up to £3000 worth of Ravenol high performance lubricants. Matthews commented “We hadn’t had the best of mornings but it seemed to really come together on the afternoons stages. We knew we had clinched the class but the naming of the winner of the challenge was held off until the event presentation. It was quite nerve racking waiting for the announcement, which has obviously made me immensely happy. I am a clubman competitor and to win what I believe to be the biggest prize available during my rallying career feels great. I can know look to plan a full campaign for 2015, something which has never been financially viable for me previously. I must take this opportunity to thank my supporters who have made this attempt possible, and of course Brian Chase of Ravenol and Nicky Grist for this prize.